The rhetoric of the bilious debate over Social Security sounds awfully familiar. To President Roosevelt, the program to provide pensions for Americans age 65 and older was a safety net for families getting crushed by the Great Depression. To his critics, it was a job killer. When he proposed it in 1935, the former head of the chamber of commerce, Silas Hardy Strawn, dubbed the plan an effort "to Sovietize America." Other critics cried socialism, and Senator Daniel Hastings of Delaware said passing the plan would "end the progress of a great country." Despite such dire predictions, most Americans supported the program, and Social Security sailed through both houses of Congress with votes to spare. 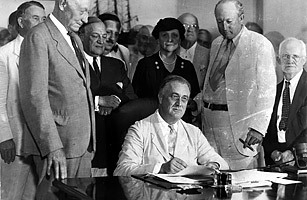 Roosevelt signed it into law on Aug. 14, 1935.